First of all, go here, because I have gone over most of this before. She was my first choice for Tsundere Tuesdays, and it should be no surprise that she has ended up on this list. 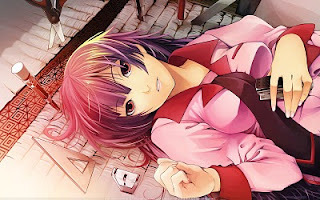 Background: Hitagi is the first female protagonist of the light novel/anime series Bakemonogatari. Each novel, or arc, deals with some super natural phenomenon that has happened to some unlucky girl and the hero, Araragi has to solve the problem. 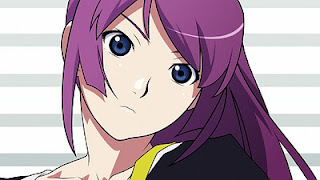 Hitagi's problem is that she is cursed by some otherworldly crab that has made her weightless. You would think that, being a teenager in high school, weighing nothing would be a dream come true, but that is not the case. She has to literally find ways to hold her down and give her some gravity. Despite her warnings, Araragi interferes and solves her problem, leaving her in his dept and eventually falling in love with him. Why she is on this list: Moe, the literally definition of the term, which no one uses any more, is the actually falling in love with a fictional 2D character. I can say from the first episode of Bakemonogatari, I fell head over heels in love with Senjogahara. She is very possibly the embodiment of what I find to be the perfect woman. She is intelligent, dripping with sarcasm, has a killer body, Asian and beautiful. Perfect. She is dry and insulting, and loving and caring. She never throws a fit or tantrum, like so many tsundere's do. She just states her business and does her own thing. After her weight is returned, she technically has no more "supernatural" powers left, but if you just watch her for a bit, you might find yourself transfixed by her, and thus pondering if maybe she does have some vampire-like charm. Senjogahara should probably be higher in this list, but I screwed the pooch when I watched the show. Bakemonogatari was one of the most compelling and interesting shows I had watched in years, and I sped through the show at a record pace. As such, I feel if I had moved through it slower, it would have had a better chance at cementing a place in my heart more than it has. Regardless I haven't watched the last two episodes yet, just so I can savor them and watch the series as a complete experience some day soon. I say all this because it directly impacted my feelings for Hitagi. The reason I say she should be higher, but isn't, is because there just isn't enough out there of her. There are some episodes she isn't even a part of, and really she becomes almost a minor character until the end of the series. I want more Senjogahara. Lots more, but there just isn't enough, and probably could never be enough to meet my demand. The novels don't really help me any (for one, they aren't translated) because she is a different character. After she is "cured" she stops being Tsundere and is just dere. So the continued existence of Senjogahara as a Tsundere is an anime exclusive. If I haven't plugged it enough already, please check out Bakemonogatari if you haven't yet. It is one of the most imaginative anime to come out in recent years and really deserves as much attention as possible. Saito started voice acting in 1999 for One Piece and has had a full career ever since. She is part of a voice acting duo, which I have never heard of until reading her bio. She is also part of a seiyu quartet, again I've never heard of such a thing, and they are known as "MORE PEACH SUMMER SNOW". You can't make this stuff up, people. The quartet all perform voices for Sgt. Frog (one of my favorites). Saito voices Natsumi. Some other works you might recognize her from are Anita King from Read or Die, Lavie Head from Last Exile, and Francesca Lucchini from Strike Witches.